I just wanted to give you an update on Leroy (2 year old) which we adopted on 12/28/03. We renamed him Koda and he's adjusted well. We really enjoys all the attention from the kids. He adjusted easily to sleeping in his crate in the house during the night. We're working on training (sit, lay down, etc.) and it started off slow until we found treats he really likes. 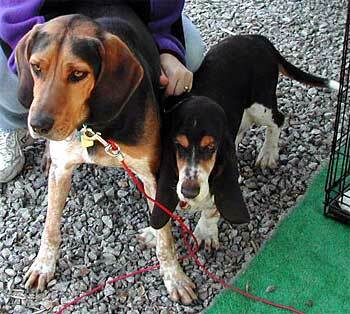 Attached is a picture from his first camping trip with the our basset (Leah).